This eighteenth century convent surrounded by orange trees is run directly by nuns. 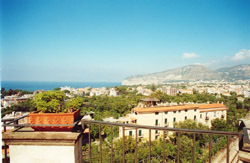 It overlooks the Sorrento Peninsula and from its terraces and one can admire the Gulf of Naples with its coasts, the mountains, the islands and Mt Vesuvius. 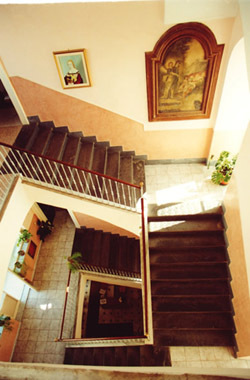 Located 1km from the city center, this religious house lies in a peaceful place away from traffic. 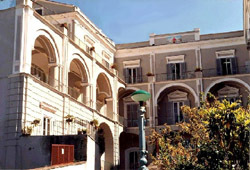 This Convent can host up to 65 beds in 17 rooms on two floors provided with a lift, each equipped with bathroom with shower and hair dryer. 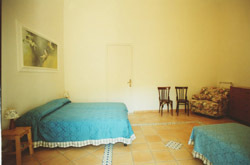 We have the availability of some rooms for an entire family with kitchenette. 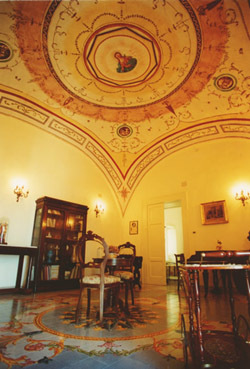 There are also a TV room, an elegant reading room furnished with antique furniture and a dining room. Customers can also take advantage of a wide courtyard that surrounds the building for relaxing walks and a panoramic terraces equipped with chairs, sun beds, tables and a gazebo. 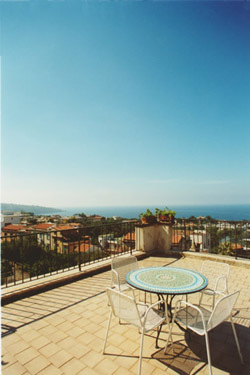 Reception - Internet wi-fi (free) - Daily cleaning (without making the beds) - Change of the linen – opening of the Convent until hours 24.00 - Public telephone - TV in every room - Free car parking in the courtyard - Banks, restaurants , shops and bars within 100 meters. - Central heating - Bathing establishment (reachable by pay lift) at 600 m. - City center, railway station, post office, port at 1 km.